NEW DELHI, India, December 21, 2010 (ENS) – India’s National Tiger Conservation Authority has granted approval “in-principle” for four tiger reserves across the country and has requested proposals for four additional reserves to protect the endangered big cats. Jairam Ramesh, minister for environment and forests, confirmed the four reserves and the request for proposals in a written reply to a question in the upper house of Parliament last week. 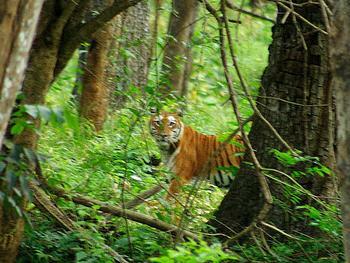 Sunabeda, in the densest forest in Orissa state, with about 32 tigers. In addition, three states have been advised to send proposals for declaring four more areas as tiger reserves: the areas of Bor and Nagzira-Navegaon in Maharashtra state, the Suhelwa area in Uttar Pradesh, and Satyamangalam in the state of Tamil Nadu. The establishment of tiger reserves does not guarantee protection for India’s tigers as poaching the endangered animals is still rampant both within and outside reserves. A tiger that was found dead in Sariska Tiger Reserve last month had been poisoned, said Rajasthan Forest Minister Ram Lal Jaat. Today, police launched a manhunt after the headless carcass of a tiger was found in a forested district of Chhattisgarh state in central India. Minister Ramesh said India now has an estimated population of 1,411 wild tigers, according to the latest nationwide assessment, conducted in 2008. That census shows there could be as many as 1,657 tigers and as few as 1,165, Ramesh said. Worldwide, there are an estimated 3,200 tigers remining in the wild. A countrywide assessment using “refined methodology” is done once in every four years on the status of tigers, co-predators, prey animals and their habitat, the minister explained. The 2008 tiger population assessment is based on determining spatial occupancy of tigers throughout potential tiger forests and sampling these forests using camera traps in a statistical framework. This assessment is not comparable to an earlier count using pugmarks, or footprints, due to what Minister Ramesh called “shortcomings” in the pugmark study. The tiger population in India at the turn of the 19th century was estimated at 45,000 animals. The first ever all-India tiger census, conducted in 1972, found only 1,827 tigers, and they are still disappearing due to poaching and habitat encroachment. In 1973, the government-sponsored Project Tiger was launched with the creation of Palamau Tiger Reserve in Bihar state, India’s first tiger reserve. 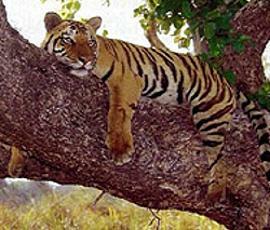 The reserve, which had 42 tigers in 2003, has just six left now, according to the 2009 tiger census. The 2009 tiger census was not conducted in the core area of the Palamau reserve due to difficult terrain and the presence of Maoists, field director P. Upadhaya told the Indo-Asian News Service in November. He said that could account for the low number of tigers counted. Before the creation of Palamau Tiger Reserve, the management of these forests was commercial. The entire forest area was ravaged by fires every year. Poaching was rampant and the area was open to grazing. Today some of these problems persist. Villagers graze nearly 100,000 head of cattle all over the reserve, but they are traditionally allowed to graze their cattle only in the buffer zone. The total human population in villages surrounding the reserve has been projected at over 110,000 out of which 39,000 people live within the reserve boundary. On average, 5.3 percent of the reserve is affected every year by fires, many set by humans, degrading natural forests and hampering regeneration. India now has 38 tiger reserves in 17 states, each created based on a what the National Tiger Conservation Authority calls a “core-buffer” strategy. For each tiger reserve, management plans are based on the elimination of all forms of human exploitation and biotic disturbance from the core area and rationalization of activities in the buffer zone. Under Project Tiger, funding assistance is provided to states for relocation of villages from the core of critical tiger habitats. Minister Ramesh said in response to another question that this year India has provided 3533 lakh rupees (US$7.8 million) for relocating villages from five tiger reserves in five different states.